The turnout of 15,000 fans was a far cry from the 3,000-5,000 you get in domestic league games (see below). The arena of the home team, BC Zalgiris (Lithuania), probably also held good memories for the four members of the Russian national team on CSKA, because it was where they won their Eurobasket bronze medal game against Macedonia a month ago. 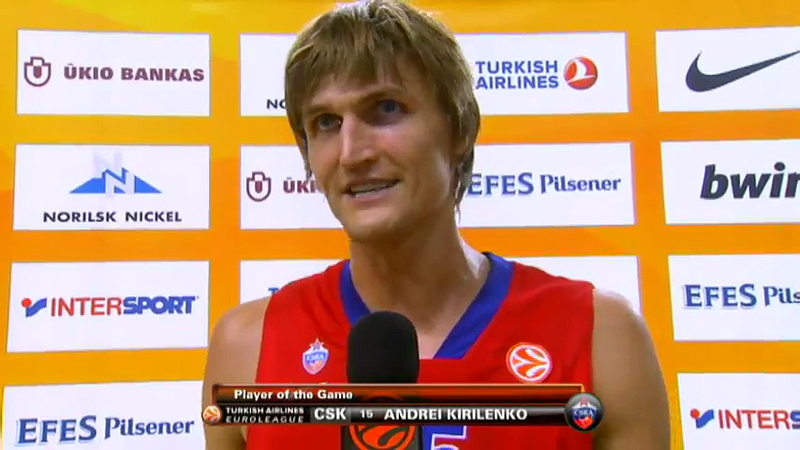 ** Andrei was not only the Player of the Game, but also had the Dunk, Assist, and Block of the Night. ** They call technicals for flopping in Euroleague! It’s funny because European players are largely blamed for bringing flopping into the NBA, yet Euroleague penalizes flopping while NBA refs continue rewarding players for their [bad] acting. Euroleague is the king of competitions in European basketball, with participating teams changing every year based on league invites and qualifying tournaments. CSKA plays in three different leagues whose seasons take place simultaneously (and I thought the NBA schedule maker had it tough): Euroleague (24 teams), Russia’s Professional Basketball League (10 teams; Russia’s equivalent of the NBA), and the VTB United League (18 teams; league of Eastern and Northern Europe’s top teams). The first two games that AK played in were both VTB United League games. The above is just a long-winded way of explaining that AK is wearing #47 in VTB games, but #15 (his national team number) in Euroleague games because #47 is not an allowed jersey number in Euroleague.